Bird Rock Beach Hotel is located on a secluded cove near the town of Basseterre. Views from the rooms and suites overlook the sea in two directions. 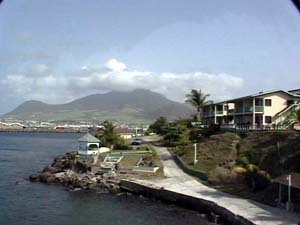 Southeast from the balcony or patio is the ocean stretching towards the island of Nevis. Northwest the views are of the Bay of Basseterre, the town, and the mountains. The hotel has two restaurants and bars, a fresh water swimming pool with a swim-up bar, tennis court, and a volleyball net. 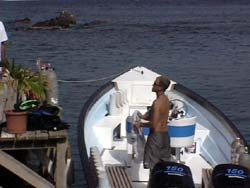 My diving in St. Kitts was in the summer of 2000. There was some interesting shallow diving directly off the Bird Rock Beach Hotel. Squid, flamingo tongues, seafans, clams and other colorful life abound. We went to many unique interesting sites on the dive shops one boat, which, at that time, was uncovered. I was told that the canopy was on the way. While there was much life at the many calm sites on the Caribbean side of the island, we also dove in the channel between St. Kitts and Nevis. We braved the much rougher waters of the channel to dive Monkey Shoals and Nag's Head with incredibly abundant marine life. 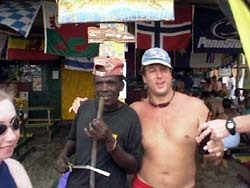 After these dives we were treated to the Island Atmosphere at Sunny's, a wonderful open beach bar and grill on Nevis. The walls are covered with pictures of the many celebrities, who love to spend there vacations on Nevis lazing away the days at Sunny's. 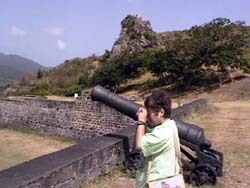 One of the more interesting dive sites on the calm side is called Brimstone, named for the Fort, high in the mountains, used to defend St. Kitts for many years. 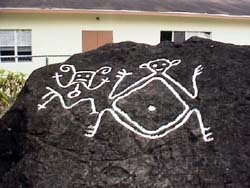 A tour of Brimstone itself was very exciting, as was our tour of the Gabrielle Batik, Romney Manor, and the Wingfield petroglyphs. 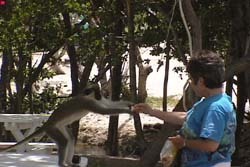 A must is a visit to the cafe on the eastern tip of the island where African Vervet Monkeys join the diners every day for lunch.